After a long time not having the famous Ampang yong tau foo, I decided to head there to benchmark my taste buds to what seems to be the yong tau foo capital of Malaysia. 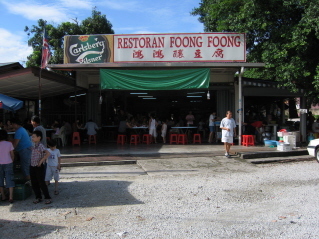 I head to what seems to be the most popular one, Foong Foong. The place has an air of snob; when I sat down, someone came over and told me that I had to order at the counter, which I obediently obeyed. No choice of yong tau foo, only quantities. Sigh, what a choice. Once ordered, the person you ordered from at the desk will pick up their microphone and read your order over the PA system. When the kitchen is not sure, the kitchen will go on air and ‘announce’ back. It is interesting when there is an argument. The strange thing is, although the quantity of yong tau foo is ordered at the counter, someone will go over to your table to take orders for drinks. I do not understand the dual system. The outdoor kitchen spots what seems to be an extended family at work, including young people. In no time, my yong tau foo came. The tau foo (tofu) was very fresh, as though fresh out of the mold and it was very soft. The fillings of all the young tau foo was disappointing, rather plain and starchy. I was expecting meaty filling, especially for the premium they charge. The sauce, sigh, was diluted soya sauce. I then recall a number of places which has better young tau foo. My benchmark of Ampang yong tau foo was reset to a lower level the moment I walked out; I now know places which have surpassed what was once the pride of Ampang. Remarks: Not the best yong tau foo in KL. Popular probably because it is legendary “famous”. Getting there: Head towards the Ampang Police Station, take a right at the light after that, pass Spectrum and to the end of the road, turn right and it is on the left. 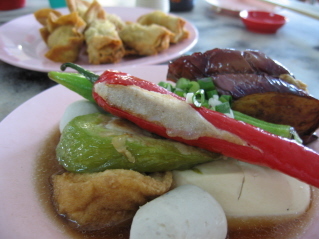 The place spots a whole row of yong tau foo shops, even before arriving at this shop. Originally published at tasek.net on the 17th of April, 2006. Re-published with permission.